Manchurodon simplicidens (2) Eutriconodonta "Amphilestidae"
Mesozoic sequence may be revised upward, this estimate may be too old. Liaotherium gracile represents another Jurassic, perhaps Middle Jurassic, mammal from China. From the Fangshen locality, Haifanggou Formation (= Jiulongshan Formation), Lingyuan County, Liaoning Province, the specimen consists of a dentary with part of the last molar; Liaotherium is tentatively referred to the eutriconodon-tan family "Amphilestidae" (see Zhou et al., 1991, and chapter 7). The final mammal occurrences in the Middle Jurassic of Asia are from the Balabansay Formation, Fergana Depression, Kirghizia. The site of Kalmakerchin has yielded a possible docodontan, based on a badly broken upper molar and an ulna (Nessov, Kielan-Jaworowska, et al., 1994). Also known from the site are salamanders of the family Karauiidae, known only from the Jurassic; an overlying unit has yielded leaves reported to be of Middle Jurassic age (Averianov, 2000). 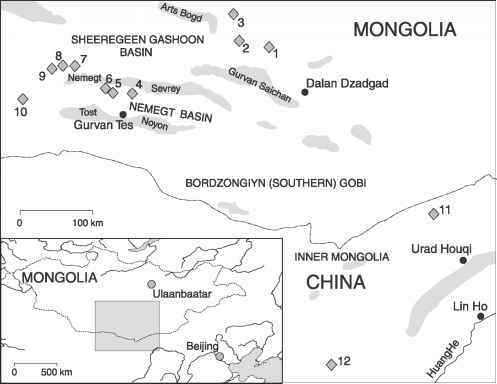 A second, nearby site, Tashkumyr, has yielded a lower molar referred to Docodonta, as a possible relative of Tegotherium Tatari-nov, 1994, from the Late Jurassic of Mongolia (see chapter 5 and Martin and Averianov, 2001).